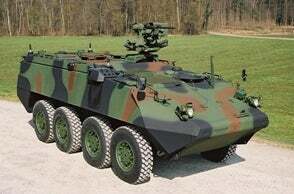 Copenhagen Sensor Technology (CST) has been awarded a contract with General Dynamics European Land Systems – Mowag (GDELS-Mowag) to provide a local situational awareness system (LSAS) for the Irish Defence Forces Piranha III APC upgrade. This programme is set with a delivery plan from 2017 to 2021. Following negotiations, CST was selected as the preferred supplier by GDELS-Mowag for the LSAS, which will provide local situational awareness for each vehicle consisting of both day and night capacity, infrared (IR) lamps, multi-functional digital displays, matrix and cable set. Images from all sensors can be shared around the vehicle. The functional display can be customised to suit the user / operator’s requirements and multiple images can be viewed on screen to provide maximum information as required. The structure of the system allows the operator to plug and play with different sensors and will enable future updates as required. All mission systems will include CST’s Citadel Quattour Cam, which can support both day and night operations, colour and thermal imaging capability to enable the driver and crew members of the vehicle to operate safely and with confidence in all weather conditions. In addition, the mission system will consist of Citadel compact cameras to support a 360-degree surveillance in order to secure, as well as support all crew members during operations. CST builds upon systems delivered to other customers worldwide to provide situational awareness systems to the vehicle crew-members with keywords being safety for operators. "It is with great pleasure for CST to announce this partnership with GDELS-Mowag to supply a complete situational awareness system for the Irish Piranha III upgrade programme," said Klaus Aude, Vice President Business Development at CST. CST is a leader in ruggedised electro-optical solutions with advanced knowledge in the whole process from design, development, manufacturing and maintenance of electro-optical solutions.